Sister ship to the Athara, Bithia is 8 decks high and 214 metres in length and can carry around 2800 passengers and up to 900 vehicles. Amenities you will find on board include a cinema, children’s play area, a bar, self-service and an al carte restaurants plus much more. Please Note: Whilst we have taken great care in making our Bithia guide as accurate as possible, onboard facilities, services and entertainment may vary depending on the date and time of year that you travel, facilities mentioned may change without notification and ferry companies reserve the right to operate vessels other than those mentioned at time of booking without prior notification. "Excellent experience with Tirrenia Civitavecchia-Olbia"
We were in four with a cabin and car on the route Civitavecchia-Olbia-Civitavecchia. Excellent service. Kind staff, good value for money at the restaurant on board. Tirrenia Bithia is a very comfortable ship, the cabin it was first class for real, big and clean. There are not so many bar/restaurant/self service, but it was fine. Really good breakfast at the restaurant. The restaurant, the seats and all the enviroments are really fancy. Good welcoming and staff, food should be improved and served hot. The ship was ship shape, on time, the cabins compact/clean and comfortable. BUT the boarding process in Civitavecchia utterly chaotic. Poor signage, only one luggage scanner and not enough staffing. Better in Cagliari but still long lines to check in. The sit down restaurant was a real disappointment. They did not have half of the items on the menu and and did not provide the proseco as the menu advertised for the fixed price diner. My advice "self cater" unless you are a snack bar fan. Both the booking arrangements via Direct Ferries and the crossing itself with Tirrenia we excellent - all staff on board friendly, helpful, and efficient. All on time. Highlly recommended. "Ferry crossing Genoa to Olbia"
just to let you know we loved our trip on the 'Bithia'. The cabin was very comfortable. All staff were very helpful and polite. We hope to visit Italy in the future and take another trip on one of your ferries. Katharina Thomas and Stephen Smith GB. Excellent way to speed up time! Excellent service, punctual, apart from the priority gave to truks during boarding and landing. "Porto Torres Genoa 5th November"
"every thing went smooth as silk." "23 years Of Tirrenia outbound and return"
departure on time. Good and clean cabin. Bad food at the self service restaurant. There are no seats for everyone on the deck, shame! It was our first experience with Tirrenia, very positive. fast, cheap and easy the online booking system on DirectFerries website. 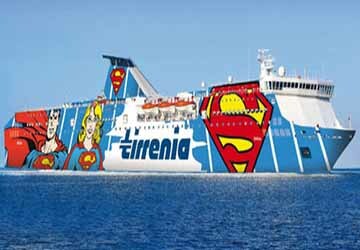 Tirrenia should improve the service on board now. "Direct Ferries YES - Tirrenia NO"
so, I'm ging to Sardinia every month for work. I have nothing to say about Direct Ferries because the service is always the best. But Tirrenia, €730 for 2adults, 1 child with cabin and a car, return ticket, I think is very expensive.